Over 10 wards in the Siliguri civic area were inundated this morning after continuous showers in the past 24 hours. The rainfall also led to landslides in at least five places in which snapped transport movement between hills and plains for some <>hours. This morning, a youth from Baghajatin Colony in Siliguri went missing in the swollen Mahananda. Sources said Pawadhon Das, 22, had challenged his friends for Rs 200 saying he would be able to swim to the other bank of the Mahananda and return. The youth jumped into the river but could not be traced after that. Local people have informed Pradhannagar police about the incident. In the past 24 hours, Siliguri has recorded around 140mm of rain and Sevoke has received about 180mm. "The southwest monsoon is active over sub-Himalayan Bengal and Sikkim. That is why heavy to very heavy rain has occurred in some places. The axis of the monsoon trough at the mean sea level continues to run in the foothills of the Himalayas. 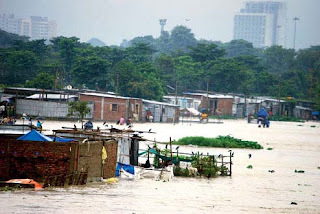 There is a forecast of more rainfall in the region in the next four-five days," a source at the Regional Met Office in Jalpaiguri, said. In Siliguri, inundation was reported in wards 1, 4, 5, 31, 32 and 33. Most lanes and streets were under water in these places. Partial inundation has been reported in wards 10, 24, 43, 44 and 45, Siliguri mayor Asok Bhattacharya said. "We have visited some of the affected areas. Our officers are in touch with the subdivisional administration and the irrigation department. The water started receding from this afternoon," Bhattacharya said. Met office sources said Bagdogra received 100mm of rain and Darjeeling and Cooch Behar both recorded 50mm of rainfall in the past 24 hours. Kalimpong received 40mm. Because of the showers, water level in rivers and streams like the Mahananda, Panchnoi, Balason, Fuleswari and Jorapani have risen. A road near the Mahananda river went under water this morning. "Officials of the state irrigation department have informed us that the water level in the Mahananda had reached to 114.50m. Around 10am, the water touched the 116.20m mark, which is close to the extreme danger level. The water started receding after 11am," the mayor said. Darjeeling district magistrate Anurag Srivastava said landslides have occurred at Chelaunayduhura in Pankhabari Road (that connects Garidhura with Darjeeling), Rati Khola area on Mirik Road (near Garidhura), on NH31 near Sevoke Kali Temple, near Kargiljhora on Rohini Road and on the Karmatar-Jorethang Road. "All the roads have been cleared and traffic resumed after some time," he said. A small bridge over the Singhijhora stream on the outskirts of Siliguri was damaged during the rains. A small part of a bridge on NH55 at Panchnoi near Dagapur has caved in, sources said. Many low-lying areas of Siliguri subdivision got waterlogged. "Rescue teams and relief materials have been kept ready," an administrative official said. Over 10 wards in the Siliguri civic area were inundated this morning after continuous showers in the past 24 hours. The rainfall also led to landslides in at least five places in which snapped transport movement between hills and plains for some <>hours.